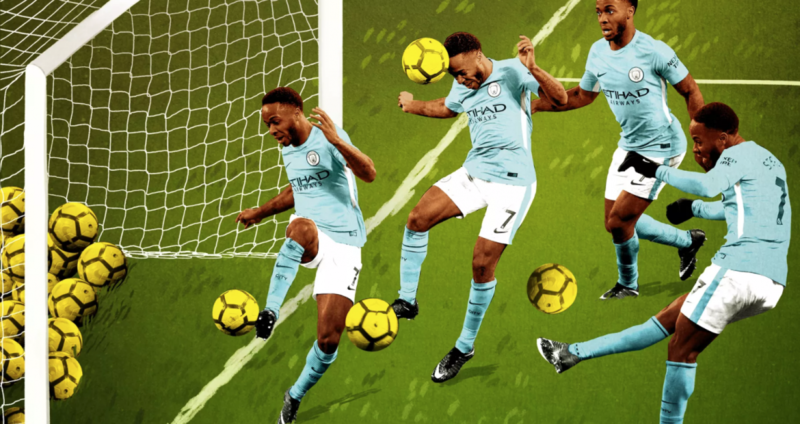 In January, I wrote a piece for the Ringer called “Raheem Sterling Proves That Everything You Know About Goal-Scoring Is Wrong”. The piece is about the making of a consistent goal-scorer in elite football and what is most important. Using an augmentation of a traditional expected goals model, inspired by the work of Devin Pleuler, I believe the article makes a convincing case for chance-getting’s relative importance compared to chance-taking. In a professional footballing environment, the disparity in shooting ability between players seems to be smaller than the disparity in the suite of subtle factors that make up getting the chances themselves: movement, shot taking, intuition with team-mates, and so on. Of course, getting chances is also contingent on having team-mates who can create them, and so I believe a natural extension of this work would be to attempt to isolate the relative importance of creator and finisher. This, though, is no easy feat. Like development economics, football analytics is likely to need to rely on the natural experiments provided by transfers to find some proxy for this effect. If a world-class pair of creator and finisher are split up, and the striker that comes in is obviously worse, how much output is lost, and vice versa? I hope the field is able to attempt to tackle these questions soon, and we continue to make break-throughs that inform our understanding of the sport. Copyright 2018 Analytics FC Ltd. All rights reserved.